MEA-Triazine Analysis Cartridge | OndaVia, Inc.
MEA-Triazine is an important hydrogen sulfide scavenger used in the treatment of sour oil and gas. Conventional testing for triazine-based scavengers involves expensive, complicated laboratory methods that can take weeks to complete. With our simple, easy-to-use system for rapid analyte detection, it is possible to perform on-site, laboratory-grade testing for MEA-triazine in fresh and spent scavenger solutions. The reduction in testing time from weeks to minutes enables better decision making on when to replace scavenger solutions, improving scavenger system performance while reducing material and labor costs. 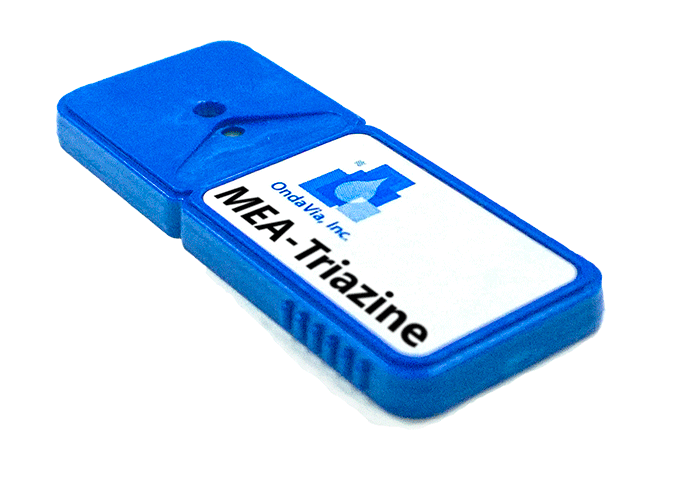 When coupled with our dithiazine and monoethanolamine cartridges, the MEA-Triazine cartridge offers complete analysis of hydrogen sulfide scavenger solutions. In quality control / quality assurance applications, our MEA-triazine test provides a direct measure of the triazine content. The measurement of a total amine value through titrations, for example, only provides a total MEA content in your samples, while our approach provides a true measure of the triazine value.